Jordan Hamilton analyzes the defense. The freshman guard had a career-high 22 points to lead the Wildcats against Wisconsin on Thursday. One night after Bryant McIntosh powered the men’s team to victory, freshman guard Jordan Hamilton put on a clinic of her own in the Wildcats’ 69-60 win over Wisconsin. While McIntosh controlled the game as a distributor, dropping a school-record 16 assists, Hamilton led NU (9-10, 2-3 Big Ten) with her scoring. The rookie finished with a career-high 22 points on the night, which led all scorers. She added five assists and two rebounds. With fellow freshman guard Lindsey Pulliam sidelined in the first half with foul trouble, Hamilton carried the load, putting up 10 points in the first half, highlighted by a spectacular 4-point play in which she drained a 3-pointer while being fouled and converted the ensuing free throw. That efficiency was on display the entire night. Hamilton took only eight shots from the field, but made six of them, including three of her four attempts from 3-point range. She also put the game on ice at the end, flying past the Wisconsin defense for a layup and nailing a series of clutch free throws to put away the Badgers (7-11, 0-5). Even more importantly for the Wildcats, Hamilton kept the offense under control and avoided costly giveaways. NU committed only 12 turnovers, more than four below its season average, and Hamilton was responsible for only three. The Cats, who averaged slightly more turnovers than assists coming into the game, finished with 20 assists. 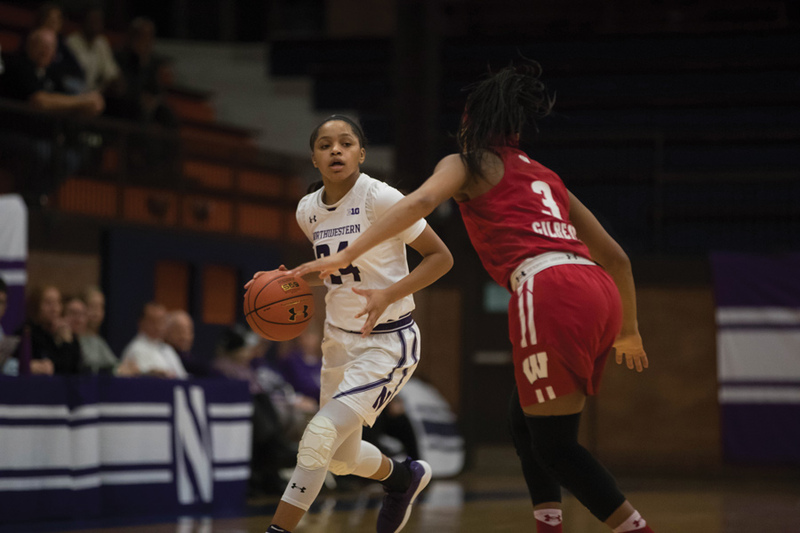 Hamilton has put up 15 and 22 points in consecutive games, and NU will likely need her to continue scoring at a high clip to compete throughout the conference schedule. Currently, the Cats sit in the bottom half of the conference, and their only two wins have come against the only two winless teams in the conference — Illinois and Wisconsin.